Little of the geography of the Summerset Isles is known. Cloudrest, atop Eton Nir, the highest mountain in Summerset, is an odd mixture of architectural styles, with buildings like strangler vines, built on top of older structures. The oldest, and most isolated, of all ruins there are made of coral, which must have been carried many, many, miles away from the sea. This may suggest original occupation by the Sload, who lay claim to the archipelago and have long coveted it. The largest island of the Summerset archipelago. The second-largest island, located closest to mainland Tamriel. The third-largest island, historically located off the southwest coast of Summerset Isle. It is the sanctuary of the Psijic Order, and has a tendency to vanish for centuries at a time. A small island south of the port of Skywatch and east of the town of Mathiisen, the site of a hidden Aldmeri ruin. An island off the coast of Auridon, near the city-state of Firsthold in the Abecean Sea. An unnamed island within sight of Lillandril is dominated by the College of Sapiarchs, the academic heart of the Summerset Isles and school to the royalty of Alinor. An island off the coast of Auridon formerly occupied by the Psijic Order that houses the Psijic Obscuros, a powerful scrying device. A small island to the east of Skywatch. It was used by the Aldmer as a mercantile hub, and later served as a Sload beachhead for invading Auridon before the All-Flags Navy purged them. An island north of Summerset, purchased by Arch-Mage Shalidor in the early First Era and subsequently lost in The Shivering Isles until the mid-Second Era. 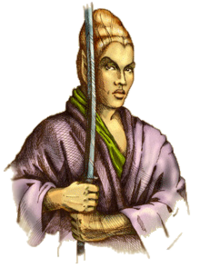 Illustration of a typical Altmer male. Altmeri tradition holds that their ancestors, the revered Ancients, first made landfall at the Summerset Isles on the northernmost shore of Auridon, at a site called Nine-Prow Landing in the middle of the Early Merethic Era. The legendary High Lord Torinaan was the very first Aldmer to disembark from the foremost of their nine ships. Torinaan claimed the island for his people, gave Auridon its name, and swore a blood-oath that he would never leave it. As the Aldmer began to explore the island, they encountered a number of fearsome native creatures known as the Gheatus, Ilyadi, and Welwa. While some suggested they flee for safer lands, Torinaan refused and battled with the monsters, slaying them with powers drawn from the teachings of his ancestors. Free of danger, the Aldmer resumed taming the land, using magic to sculpt and tend it to their liking. Firsthold, the "First among Holds", was the first city they built, not far from the original landing site. Afterwards, the Aldmer spread throughout Auridon in earnest, eventually inhabiting the rest of the Summerset Isles and colonizing mainland Tamriel. They built numerous cities and wonders such as the vaunted Crystal Tower. Over time, the Aldmer of Summerset became the Altmer, and the society of the Isles became divided into different social classes. At the top were the Wise, who served as teachers and priests, followed by the Artists, Princes, Warriors, Landowners, Merchants, and Workers. At the bottom were the tamed beasts, such as the goblins who were native to Summerset, which were enslaved. Once the city of Alinor was established, it became the capital of the Isles and seat of the Altmeri monarchy. Despite the idyllic way of life the Altmer established for themselves, they were never free of conflict. The Sload frequently used their necromantic powers to attack and invade the Isles, such as in the Sack of Skywatch in 1E 1301 and the War of the Uvichil between 1E 2911 and 1E 2917. The Altmer's envious cousins, the Maormer, also constantly endeavored to wrest the Isles away, believing themselves to be the true heirs of Aldmeris and therefore the rightful owners of Summerset. 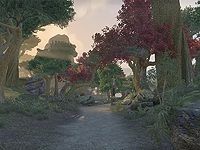 Although the precise circumstances are unclear, the Summerset Isles became incorporated into the Second Empire, which at its zenith controlled all of Tamriel with the exception of Morrowind, in the late First Era. This concession was apparently arranged to the Altmer's advantage: all outsiders aside from traders and Imperial ambassadors were prohibited from traveling to the Isles, and these privileged few could only conduct their business within the capital of Alinor. Eric of Guis, the personal emissary of Emperor Reman II to the Altmer, noted in his journals that while the Altmer reliably paid their tithes to the Empire, they did so purely to minimize contact with non-Altmer rather than out of a desire to avoid war with the Empire. 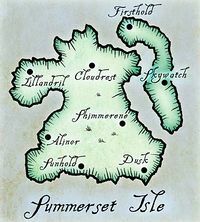 During the Interregnum, the Summerset Isles were a part of both the first and second Aldmeri Dominions. The first Dominion was founded by the storied Queen Ayrenn of Alinor, who joined the Isles with Valenwood and Elsweyr in 2E 580 to oppose the Daggerfall Covenant and Ebonheart Pact in the Alliance War. However, many Altmer opposed the Dominion—which they saw as a threat to the purity of their isolated Isles—and groups like the Veiled Heritance were formed to undermine the alliance. As Queen Ayrenn was often away from Summerset, dealing with issues in other parts of the Dominion, she appointed her cousin Alwinarwe Proxy Queen of Alinor, to handle affairs on Summerset Isle in her place. The second Dominion arose centuries later in 2E 830, when the Summerset Isles conquered Valenwood over a dynastic dispute. Both incarnations of the Dominion were attempts by the Altmer to reassert Elven dominance over Tamriel in the vacuum created by the fall of the Second Empire, and both ultimately failed. The Summerset Isles was the last nation in Tamriel to be brought into the Third Empire during the Tiber Wars of the late Second Era. In 2E 896, Tiber Septim wielded the Numidium against Alinor, forcing the city's surrender within minutes. Summerset Isle was then absorbed as a province of the Empire. During the Oblivion Crisis, Summerset Isle was beset by Daedra. The Crystal Tower was toppled by the daedra hordes. The Thalmor, once a minority voice, were given greater power and authority in order to deal with the crisis. They were successful and came to be seen as the saviors of Summerset Isle. In 4E 22, the Thalmor overthrew the ancient Altmeri monarchy, taking total control of the Summerset Isles and renaming them Alinor, after the capital city. Valenwood was forcibly brought under the Thalmor's control in 4E 29, establishing the third Aldmeri Dominion. Later, the former Confederacy of Elsweyr joined the Dominion as two separate client states. The capital of the Summerset Isles, on the western shore of the main island. A city in the north-central area of Summerset Isle. Also known as Crystal-Like-Law, this structure is of symbolic importance to the Altmer just as White-Gold was for the Ayleids. A city on the southeastern shore of Summerset Isle. The tallest mountain in the Summerset Isles, and the site of some of the Isles' most amazing architecture. It is located in the north-central area of Summerset Isle. The oldest city in the Isles, on the northern point of Auridon. A city on the northwestern shore of Summerset Isle. A city on the eastern-central area of Summerset Isle. A town in the heart of Summerset Isle. A city near the center of Auridon. A city in the south-southwestern area of Summerset Isle. The different spellings of Summerset Isle are found on the Arena map (also seen in Daggerfall) and Sumurset Isle on the Redguard map. 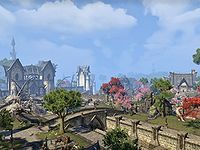 During the game of Oblivion you may overhear NPCs talking about trouble in Summerset Isle, quoting "I understand Daedra worship has become increasingly prevalent in the Summerset Isle." "They say syndicates of wizards have led a boycott of Imperial goods in the land of the Altmer." and "The Altmer have powerful wizards. It could become a dangerous situation." This page was last modified on 9 February 2019, at 19:31.